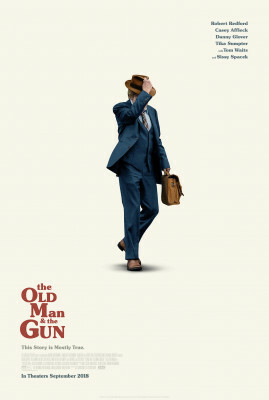 Far better than one might reasonably have expected, The Old Man & the Gun (2018), despite that awkward title, is a solidly character-driven piece based on a true story, a smallish picture surprisingly shot in Super 16mm (yet also ‘scope) that's charming and involving. The film is adapted from David Grann's New Yorker article of the same name, about elderly career criminal Forrest Tucker (not the actor, obviously) who, usually with other over-the-hill collaborators, successfully robbed an estimated $4 million in dozens upon dozens of hold-ups, mostly banks, and with typically modest takes of ten or twenty thousand dollars apiece, throughout the 1970s and ‘80s. Tucker was also a master escape artist, having successfully broken out of prison at least 18 times using a variety of methods. That aspect of Tucker's life is tangential to the plot, which focuses mostly on the robberies, though there is a very amusing montage covering this. Another curious aspect about The Old Man & the Gun is its overall look in terms of costumes, hair styles, set decoration, etc. The movie seems to span the years 1981 to 2000, yet the look of the film is firmly stuck around 1975, nor do any of the characters age appreciably, despite covering nearly two decades. It's as if, and might very well be, that given the choice between historically accurate design in keeping with Tucker's life, Lowery decided it was more appropriate to dip Redford back into the world of ‘70s cinema, one last time.